It has taken a lot of soul searching and a great amount of courage to write this particular blog. I trust that it will be taken for what it is - an unburdening, a baring of the soul. Is it necessary? Yes. Because I think people need to understand that kindness is not a weakness. It is a strength. It is based on confidence that one is loved and that every thing that matters, one already has. Thus one can be generous. The sketch above is that of two doormats. The Free Dictionary’s literal meaning of a doormat is a mat placed before a doorway for wiping the shoes. Whether it says Welcome or Come Right In – it’s for stepping on. The Urban Dictionary gives the colloquial meaning - someone who's really nice, kind, generous and sweet; often also smart and funny. They can be outgoing and extroverted, but still allow certain/most people to walk all over them. This blog is about being a doormat. Something I am afraid I have been accused of or labeled as. Even by myself. And I can happily say that I am not alone. There are many of you out there like me who have, at one point in your life, been there. That’s right. On the doorstep - ready, willing and often times, proud to be. Funny how easily you can spot them. They are not the strong, quiet types. Nor are they those shy, demure, meek-looking ones hugging the corner. They are more likely the ones who can spin a tale and keep a group talking, or laughing at some silly story of about how she had mistakenly given her daughter milk of magnesia instead of cough syrup. Yes, the ones who tell stories about themselves. Not about their achievements or their family fortunes, but those laughing-at-myself stories which keeps everyone in stitches. That openness and seeming accessibility is an invitation to any one : Come on over – share with me. Take your coat off, slip out of your shoes and get comfortable. Unburden your heart here. The Urban dictionary has other synonyms for doormat – nice guy, tool, pushover. Many of them so nasty, I dare not write them here. It goes on to describe a doormat/doormats as - dedicated friends and partners, and infallibly there for anyone who needs them with advice, support, money, homework to be copied, and expect nothing in return. A doormat is some one you can count on at any time of the day or night. Just call or appear at the doorstep and say you are having a bad day or feel let down. No long story or reason required. A doormat has an inner scanner that can spot the slightest trace of sadness or despair. It is what spurs a doormat into action. The instant response is : what can I do for you? Does being a doormat mean you do not value your own self? When you care so much about how the other feels or think, is it because what you feel or think does not matter? No, it is merely valuing the other person’s feelings as you value your own. The old maxim holds true here – do unto others what you would like others to do unto you. It is a doormat’s code of conduct. The trouble with doormats is that they hope that the kindness they bestow on others will be passed forward. That is why there is no direct expectation of gratitude or indebtedness. It is meant to be given freely to the universe and the universe will right itself. Because that is the way it should be. Perhaps, that is why the doormat-type of person is taken as a fool. Now, why would anyone want to give and expect nothing in return? Not in today’s world and the world before this and perhaps in the next. There is no such thing as something for nothing. But what one often forgets is that a doormat is laid before a door. A door which opens to a room. A room where you know your secret, your pain, even your joy, will be kept sacred and will not be held against you later on. A place where you know you are safe. And that is something – for a doormat. It is this validation of worth – as a keeper of secrets, as a person to run to in time of need, as a person of trust and a source of comfort. For the religious, it is being a Christian. For those who do not share the same faith, it is the essence of humanity. So, to all of you who have once been or have always been doormats, stay in front of that open door with pride. For only one who is truly confident, truly at peace with one’s own self worth, and who knows that he/she is blessed with love, can be so benevolent. This simple meal of chicken and rice is a family favorite. It is a humble all-in-one-dish. But for us, it is a feast - for the palate and for the soul. Boil about 8 cups of water or enough to cover the chicken. Place the chicken in the boiling water and allow to cook for 20 minutes. Turn the heat off and let the chicken sit in the hot water for another 20 minutes. Take out the chicken and allow it to cool. Remove the vegetables from the cavity. Reserve the broth. In a heavy saucepan or rice cooker, sauté the garlic, ginger and spring onions. Add the rice. Season with salt, pepper and soy sauce. Pour in the broth. Mix well. If using a rice cooker, cook as you would ordinary rice. If using a saucepan, allow the rice to boil, then simmer on low heat until the rice is cooked. Add a bit more water or broth if necessary. Boil the leftover broth once again, season with the oyster and soy sauce. Add more salt & pepper according to your taste. Just before serving, add the sesame oil and top with a few slices of spring onion. To Serve : Cut the chicken into serving slices. Arrange in a big platter and serve family style. 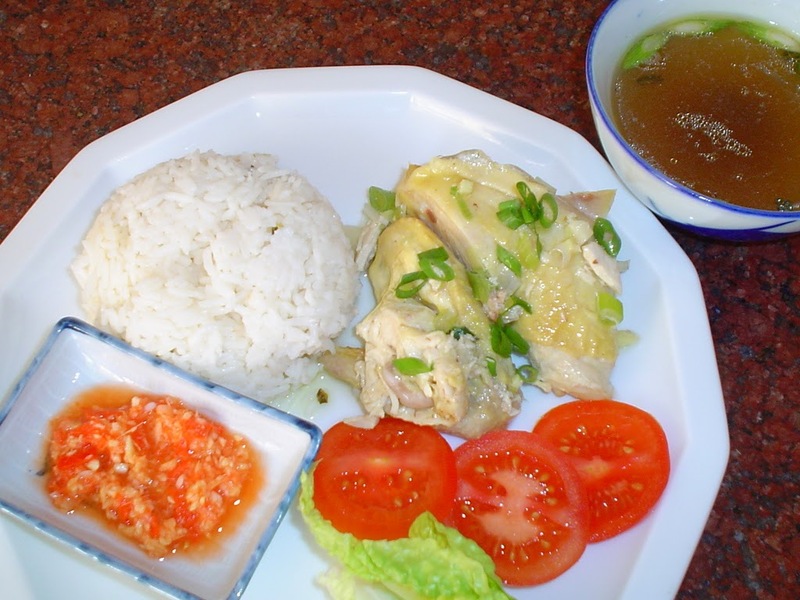 Or serve the chicken and rice in individual plates. Complement with slices of tomato, cucumber and shredded lettuce. Place the garlic/chili sauce in a dipping bowl and some light sauce in another. Serve with a bowl of piping hot chicken soup on the side. Alma - this is beautiful and so very true. Thank for the reminder to focus on generosity, always. Amy, this blog is so close to my heart. It was very painful to write. Cathartic, in the end though. Thank you for reading it and understanding.